This HiRISE image shows part of an extensive series of layered materials in a crater in Arabia Terra. The crater is about 60 kilometers (37 miles) in diameter and mostly filled with layered rocks, which are common throughout the area. This image covers a swath of the crater from the center to the rim; the rim is at the northern edge (top). The northernmost layered materials are exposed as small buttes and stacks of layers, forming circular or elongated knobs. Further south, the appearance of the layers changes, forming more expansive outcrops with a few small knobs. This could be due to a change in the properties of the layers at given levels of the crater; materials of various strengths may erode at different rates. It might also reflect local slopes or erosional processes. This area looks darker-toned from a distance, but this appears to be due to partial covering of some of the layers by dark sand. 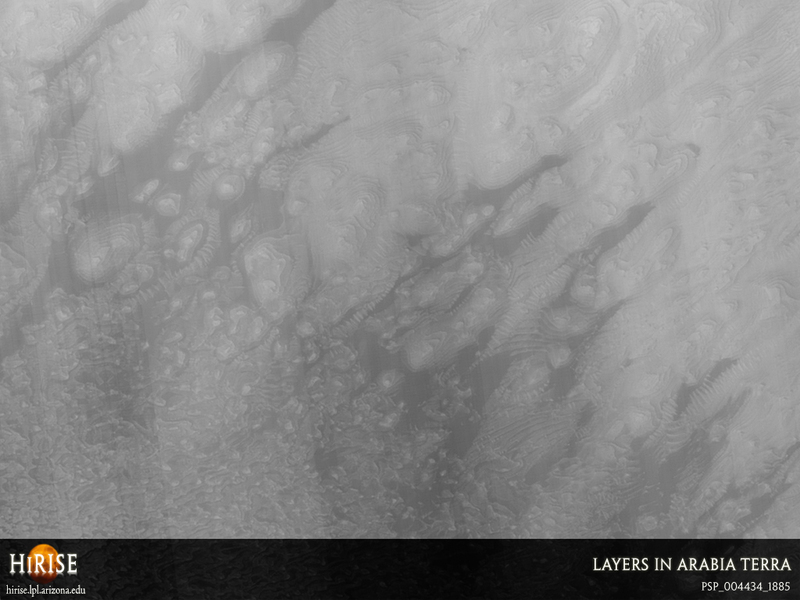 A large sheet of sand is visible at the southern (bottom) edge of the image. Many small faults are visible throughout the layers, expressed as small discontinuities and offsets; these indicate places where tectonic stresses have caused the layered deposits to break and shift.